Did you have to contact them to sort this out? When signing up for a new account I only have two payment options: direct debit and credit card. I know why they do it but idgaf, all of my previous ISPs have permitted direct credit deposits so I see no reason why Slingshot cannot. This deal does not apply to naked broadband? or is it $10 a month extra for wireless? Can I pay by online banking? Boom connected a day early, thanks slingshot! mattRSK: Boom connected a day early, thanks slingshot! 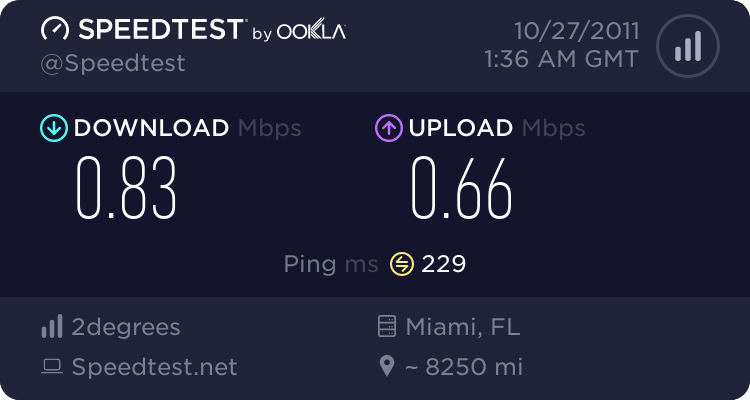 Can you do a couple speed tests please? edit: It says Snap but the internet went down earlier and came back up. Then I got an email saying I was connected so I am reasonably sure I am with Slingshot now. 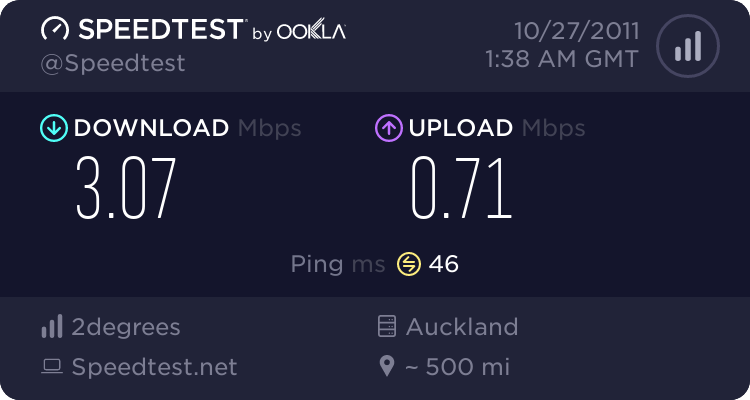 Can you please share your modem line speed and speed test results to speedtest.slingshot.co.nz also. The above test gives the speed to Snaps tester, which is one specific route. The Slingshot speed tester hangs off our core, and now also includes a VM in LA. As part of our Broadband Quality Initiative we operate speed probes at various Exchanges nationwide, and most of them operate at about 80%+ of line speed. If you are on the Slingshot Better Network there is no backhaul or handover constraint nationwide, so you get a superior service compared to BUBA. That sounds awesome - can you give any timeframe on using orcon's and compass's ULL exchange gear as you announced last year? All good I added them to my previous post. It appears that you are still with Snap. Once you're definitely across, it is worth re-running the tests! Currently not connected as I reset the router and updated my details for the slingshot account. Router log shows PPP error, contacted Slingshot who have said it will be working by this afternoon. Quick question, why can't AYCE be offered without an active phoneline? Presumably they make people have phoneline so they can make more profit, but with no price reduction incentive to have your homeline with slingshot, what is the point? NDSL AYCE please. RedJalapeno: Quick question, why can't AYCE be offered without an active phoneline? Presumably they make people have phoneline so they can make more profit, but with no price reduction incentive to have your homeline with slingshot, what is the point? NDSL AYCE please. I asked them about the homeline and they said there was a $10 discount for having their broadband and homeline together. "Broadband 10, 50, 100, 150 and 250 cost an additional $10 per month if you don't have a landline with us OR an additional $5 per month if you only have Slingshot tolls."